I'm jetting away this morning to visit my best friend and her husband who currently live in Minneapolis. I cannot wait for her to show me all the many wonderful and awesome things her new city has to offer! 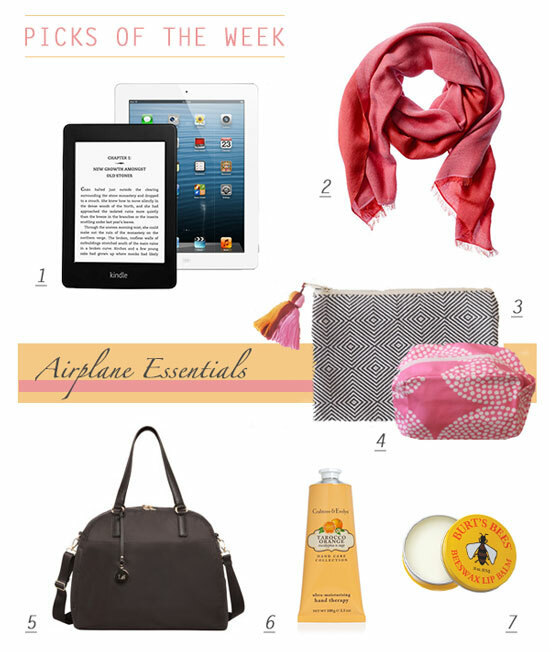 I though I'd leave you with a few of my essentials for plane travel. A great big bag to use as my "personal item" is a must! The Lo & Son's range of bags fit neatly under the seat while providing ample space and built-in protection for your computers and tablets. I also love to use small pouches to keep my jewelry and cosmetics close by rather than keeping them in my suitcase. Remember to throw in some of your favorite hand cream and lip balm, you'll thank me and yourself after sitting in a cabin full of dry, recycled air for any length of time! My last essential is a large scarf/wrap made out of something soft and cozy. Gone are the days of airplane blankets (probably for the best) so it's a good idea to pack an extra layer of warmth just in case your plane's air conditioning is imported from the arctic or you want to catch a few zzzz.